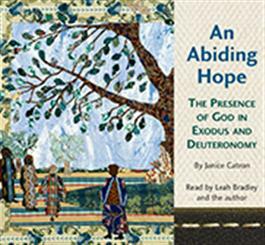 In the nine lessons of An Abiding Hope: The Presence of God in Exodus and Deuteronomy, author Janice Catron invites us to remember that the central actor in human experience is God, who redeems, who brings liberty and fulfillment even when we do not deserve it, when we cannot redeem ourselves. The instructions in Exodus and Deuteronomy for life as a covenant community were extended to people who were on the move, who knew what it is to be strangers in foreign land. These teachings both invite and challenge us to consider our relationship with and responsibility toward migrants near and far. This study is available in several editionsùEnglish, ecumenical, Spanish, large-print, and audio. Supplemental materials include the January/February 2013 issue of Horizons magazine on a Christian response to immigration and a DVD of the author explaining each lesson of the study. The audio edition is particularly helpful for those with sight impairments, those who want to enhance their study by having it read aloud, those who want to make travel time more fruitful, and others with special needs. It is a lightly abridged version with no Suggestions for Leaders. All editions and supplements, as well as other related materials (promotional poster, pendant/charm, and workshop for leaders), are available. Type ""An Abiding Hope"" into the search box to bring up the list. Additional resources are published in Horizons magazine beginning with the July/August issue.